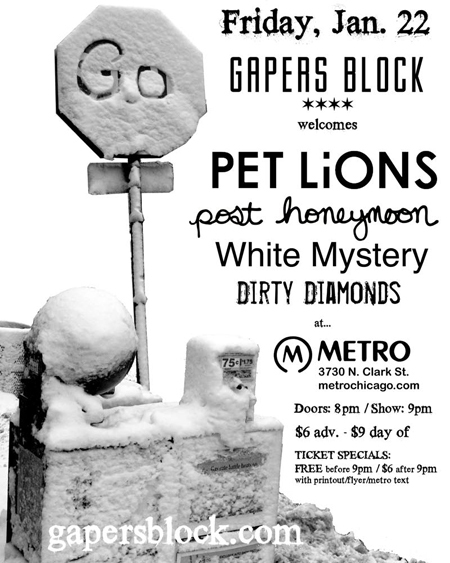 On January 22nd, Gapersblock and the Metro are teaming up again to bring you a free night of music! Our all-Chicago lineup includes indie pop lovelies Pet Lions (a client of Gallery of Carpet studios), with the adorable married pair (with dark, dreamy tendencies) Post Honeymoon, the red haired sibling duo who rock stripped down tunes that make you want to dance White Mystery (previous love here), and the excited soulful dance-in-the-pants music of Dirty Diamonds. If you bring this flyer [PDF] with you you'll get in free before 9pm (pay just $6 after 9pm with the flyer or a special Metro text on your phone, or just $9 without). You can also sign up for Metro text messages and use your text to get in free before 9pm. The Metro is located at 3730 N. Clark St. 773-549-0203. The show is 18+. If you'd really love advance tickets, they're $6. Get in free before 9pm with this flyer [PDF], or pay $6 after with flyer ($9 without).